We recently visited our Kuladeivam Kovil near Mayiladuthurai. It is a small village near Mayiladuthurai where there are no shops in the near Vicinity. We used to visit the temple at least once in a year. We perform Abishekam, Archanai and offer Maavilakku to goddess Mariyamman in the temple. Our Kuladeivam is “Putradiyal” where the goddess is said to be raised as Swayambu. A priest (Gurukkal) residing in the nearby village is taking care of the daily Pooja at the temple. We used inform him in advance and check his availability. 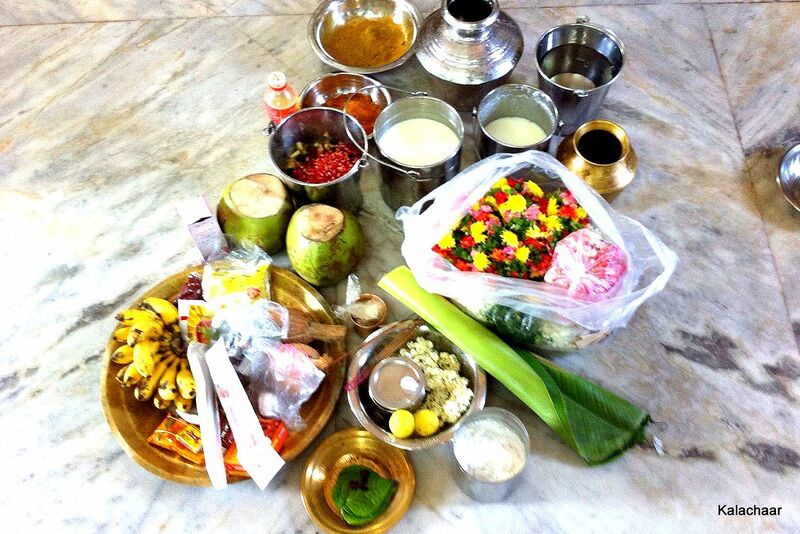 We buy all the necessary things for the Abishegam and Gurukkal prepare the Prasadham from his home. Usually, when a function like Marriage, Upanayanam, children pursuing higher education, Grahapravesam is due we visit the temple first and do the rituals to ensure everything goes well with the Blessings of god. Most families does the first time hair removal for the child in their Kuladeivam temple. I have heard and read about the importance of the worship of Kuladeivam and am now happily performing the rituals once in a year. If your Kuladeivam is close to your city of residence you are lucky enough to visit frequently. I want to share the list of things to be bought for the Abhishegam so that nothing is missed. My mom maintains a notebook that includes all the details. After Abhishegam, the god/goddess will be dressed up with New Cloths, Flowers and Garlands specially bought for the occasion. By the time the Alankaram is going on, we can prepare to offer the Maavilakku. Read my post about Maavilakku to complete this ritual. Listed below are the rest of the things that we have to buy. After the Alankaram is over, lit the Maavilakku and allow it to glow for some time. Ensure enough Ghee is available in the vilakku. At the end of the Archanai and Dharshan which usually takes 15 minutes perform Neivedhyam and show the Karpoora Aarthi. Then move the Leaves in which Maavilakku is placed towards North direction slightly to confirm that the ritual is completed. Both the Stings need to be picked carefully and placed in the lamp lit in the temple. I used the bottom side of the Udhruni to do this. That was quite easy. Some people, who live in abroad may not be able to purchase all those required. They can arrange everything with the help of Gurukkal who takes care of the Pooja. My MIL insists to go to Kuladeivam Kovil straight after starting from Home. Heard the same from few elders too. Complete the rituals in your Kuladeivam Kovil first and then visit any other temples. People who have their Kuladeivam as Palani Murugan, Thirupathi Venkatachalapathy etc can visit the temple and donate to the Devasthanam as per the temple rules. Good Blog! Our Kuladeiyvam is same as well! !